So it would appear the Cornfather’s comment from a few strips back was quite prescient. Just how much so remains to be seen. While the avalanche in today’s strip was started by jefbot’s slamming of the door, I do wonder how safe it is in the “real world” to have a room full of stacked comic long boxes, hanging posters, heavy electronic equipment and shelves filled with hardcover books, in a state known for earthquakes. Needless to say, I’m hoping to get a bit more organized by the time the “Big One” hits. First! I dont belive it! Eat that! Bwahahahahahahaha! Jefbot is dead. End of webcomic. The end. It was nice while it lasted. Xinda will have to look for new objet of her affection. Can I get Jefbots comics? whenever i have these horrific last panels for jefbot, i always think the same thing, and am always tempted to put something like, “Thanks for the yuks, folks! Goodbye!” heheh. the Cornfather has gotten some comeuppance in the past, like getting sprayed in the face with the Reich Gart, stuck in the Honda, spiders on his back, a hamster in his face, etc. but i hear ya – someday jefbot will just snap and either hire or get trained by Xinda to get some serious revenge, Maryz! maybe then your bloodlust for CF will be sated. you’re ready for your own place, Alex! Ta ja nemozem za to ze ked som musel cakat na hodinu ta som sa nudil a ze som vyuzil ten cas a cekol Jefbota. Nezabudaj, ze casovy posun je viac jak 6 hodin ta u nas je davno obed kym v USA si davaju ranajky. Inak myslim, ze sa tej jazykovej diverzite nebudu tesit az tak jak si myslis. Fajn ze si sa rozhodol dat o sebe vediet. A i ked Pikacu to zrovna nebol, Cornfather ma uz dajake skusenosti so zvieratkami na xichte. Well, I cant be held responsible for bring bored during my wait for next period in university and using that time to check on Jefbot. Dont forget that time difference is more than 6 hours so when we have dinner allready while in USA they are having breakfast. By the way, I think that they wont be as happy for the language diversity as you think. Nice to see you making yourself known. And while it wasnt exactly Pikachu before, Cornfather allready has some experience with animals in the face. okay, you and Eddie are freaking me out with your secret language, Maryz. what are you guys plotting!? Thats our native language, in its simplified form used on net. And I translated what I wrote, so other people could chipe in. And dont worry about Eddie, he didnt wrote anything dirty… This time. He was just a little surprised I menaged to be the first and wondered when was I getting up to catch it. Hej Maryz, ta ty jak to ze prezradzas nasu tajnu komunikaciu? Heh, dont worry Jeff, just letting you know that the whole world is watching this great comic. dont worry dude, nothing dirty, just bringing some language diversity to this purely english comment section, letting you know that the whole world is watching. Nice followthru on the Cornfather’s portrayal of the comic book hoarder. I hope Jefbot is still alive though! (Clearly he has to be since this is semi-autobiographical!) Would anyone ever find his body in the warehouse ‘o stuff if he died there? Things go in, but they don’t come out – he would be in there until some archaeologist explored it and found your mummified corpse. For a minute there, I thought I was going to be the first commenter this time, but Maryz and I must have been writing at the same time! Where is Spanky this morning??? 😀 She can’t be far behind. thanks, Shanna! yes, chances are jefbot’s still alive (unless this is the “semi” part of “semiautobiographical,” heheh) but will the Cornfather let him live this down? and your comment about archeology and mummified corpses skews dangerously close to what i have in store for friday’s strip, so you get the Psychic Prize this week. wish i had an emoticon for that. heheh. Jeffbot has a box of Poké balls? How long do those little guys survive in a poké ball without food? you mean your stuffed animals will come to life and smother you in your sleep or fall on you during a natural disaster, DJ? i fear both. Love it! I so enjoy the repeat of “Hell to pay!” But my favorite part of todays strip is in the last frame… Your mangled hand in the air. It’s almost as if you’re waving a white flag in surrender… Excellent job! I LOVE the color too! thanks, Funnyshaffer! glad you like the color ‘cuz it took me a ridiculous amount of time to do. i really need to figure out a way to create these strips faster. also happy you liked jefbot’s cold, twisted, crumpled hand. New movie – Jefbot and the warehouse of death! ha! i’m scared already, Jason (tcg)! Do you really have that many pokeballs? Speaking of hell to pay…none of those comics better have gotten damaged. Forget Jefbot…its the comics I am worried about!!! That’s a small fortune worth of comics that may no longer be in mint condition! ha! you’re a nerd after my own heart, Slave1 – worrying about the condition of those comics over the condition of bot’s broken body. heheh. i’m not even gonna mention some of the delicate figurines and vintage action figures that may be among the wreckage. STOP!!! you will make me start crying!!! This is too much to take in. I sure hope Friday’s strip shows that all this stuff is ok…even if jefbot is in the hospital! The last frame is gold. Well done, Jeff. I’m not worried. Jefbot is the Jason Voorhees of the comic world; he can’t die. now if only that power could transfer to me in real life, Jeff – even if that meant i’d have to lurk around lakes with a machete, on occasion. jefbot is like Charlie Brown. He just never gets a chance to win. jefbot’ll kick that football one day, eleventeen. just you wait!!! He will be able to use the “Power of Scrawn” to slip out through the cracks between the boxes. At least in Puerto Rico our walls are reforced concrete so whatever you nail to the wall is gonna remain there. Which means… that the only way things will fall off its by taking the reforced concrete walls down with them. yikes! “reinforced concrete walls”!? i hope earthquakes are rare in Puerto Rico! Well, thanks heavens I’ve never witnessed an earthquake in my life… but then, just the other days there was a very bad one in Haiti… and lets face it, Haiti is just right beside Puerto Rico! Okay, the real question here is why the hell does he (or you) have a box full of pokeballs…. the story behind all of jefbot’s (and my) pokéballs isn’t very exciting, Steve – if that bit of trivia doesn’t come out in this storyline, i’ll just tell you guys. and you sense correctly, as bot will still be trapped under those boxes come next strip. heheh. hope the boxes of soft stuff landed on him and not the boxes of “sharp and pointy” things. Super funny, bot. Those boxes falling on you is pretty funny. I love seeing you in your “Indiana Jones” room. Thank God it doesn’t really look like that. ….it’s worse. 😉 Seriously, great work, bot. thanks, man. and if you ever decide to sneak in there, know that there are all sorts of booby traps to take down any would-be trespassers. Ah well, great strip Bot! Chubman has beaten Scrawn (for now), and I see Pokemon stuff. (: Good job Jeff. awesome strip. I have a hammok full of toys that’s hanging over the end of my bed. It used to be over my head until one of the cats jumped into it and it dumped half of the toys onto my pillow. So now I sleep with my head at the other end of the bed, as I don’t want to find out what will happen when seattle’s big one comes, and the last one was in 2000, so we’re due for another big one. soon. 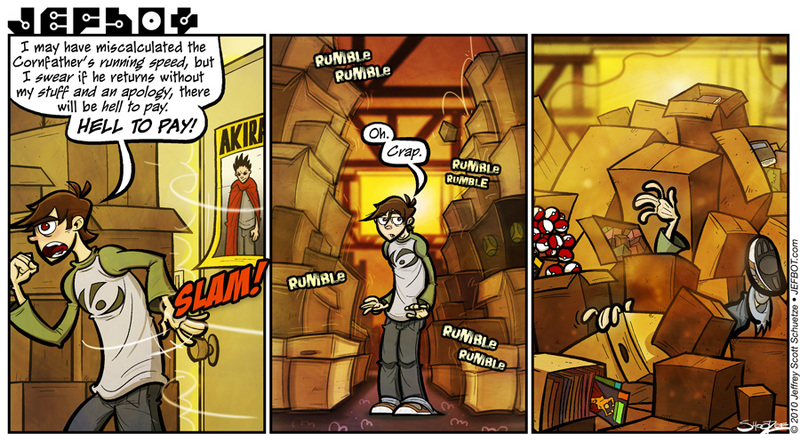 i love the little box bouncing its was down in the second panel. that one must’ve been the pebble that started it all. thanks, Kerosus! and yes: AKIRA! glad you noticed – it’s probably my favorite anime ever. loved the manga, too. We missed you. What took you so long? I think Im going to organize excavation expedition to Jefbots appartment. You in? glad you liked it, Spanky! whether or not jefbot escapes uninjured remains to be seen, but he can alway use a hug. heheh. AAAaaaAAggh! no! i’m fine! REALLY! Just started the comic today. Went through the entire archive! Yes I have a new favorite. Is it bad that Xinda reminds me a little of myself? What with the jabbing and death and stuff? And it hit me last night what room in my house Jefbot’s room reminds me off. My craftroom. Everytime I go in there I tell the Hubby if he doesn’t hear any noise for about an hour to come make sure I’m still in the room. Next comic: Jefbot’s family is seen gathered around a casket (made of PokeBalls) which contains his mangled and squished corpse. As the casket is lowered, we see the Cornfather sneaking away to finish selling off Jefbot’s stuff at a raised premium due to it being “the stuff that killed an actor”. Later we see CF sitting on a beach, outraged that he ordered a maitai and instead got a pina coloda. No salt! BUT LE GASP! Follow up comic: Jefbot wakes up screaming, realizing “oh, it was only a dream”. Then proceeds to sell his stuff, and later we see Jefbot sitting on a beach, mildly despondent that he ordered a maitai and instead got a pina colada. I love this. Jefbot should get inspired. I want that Akira poster. This storyline is inspirational. I gotta go clean or throw away something, anything. Do you really have pokeball memorabilia? Is it sad that the Akira poster made me squeal like a fangirl? I’m male.